Bruce MacNab posted a photo of B.B. Keyes, over on the Facebook group CONJURING HISTORY - BUY, SELL AND TALK. He said his name comes up in most of the Houdini biographies but little is known about him. So, I decided to see what I could dig up. Benjamin B. Keyes was born in Sandwhich, Massachusetts in 1837. He was the son of Samuel and Betsy Brown. He was an engineer by trade. In 1869 he married Sarah Russell of Charlestown Mass. According to Bruce MacNab's book on Houdini titled Metamorphosis, Keyes was a portrait photographer from Lynn Mass. But the magic community knew him as a mechanical genius. The Sphinx and Mahatma both say his greatest creation was Astarte which he developed with William Robinson. However, according to a 2006 article in MUM Magazine, the original illusion was the work of Will B. Wood who called the levitation Edna, after his wife. B.B. Keyes actually reverse engineered the illusion while working for Kellar. Besides Astarte, Keyes is credited with being a very prolific creator of magic. Many of his creations were sold through the Boston magic dealer W.D. Le Roy*. In Leroy's catalog you can find ads for The Floating Wand, invented by B.B. Keyes, and Table Lifting, invented by B. B. Keyes. There is also a big photo of Keyes in the pages of the catalog. That same photo is the one at the top of this article. Maybe his true most famous creation was the commercially available Handcuff Act*. Below is the ad from Leroy's Catalog. Please note the price, $75.00. I went through most of the catalog and most everything was under $10. A few items reached $20 and $30 and a Sub-trunk reached $50. But here was the act that put Houdini on the map, and it's price much much higher! Here now is an interesting piece from the May 1895 issue of Mahatma, "Mr. B.B. Keyes gave an exhibition of legerdemain and spirit manifestations at the E.W. Kinsely Post No.113 on April 23rd. His tricks with cards, coins, etc. were very deceptive, but the most astonishing feat of all was freeing himself from handcuffs, seemingly an impossibility. E.F. Gaskin, Captain of Police Station 14, at the request of the Commander of the Post was present with 4 different kinds of the latest improved hand-cuffs, the best the department could obtain. He applied them himself, one pair at a time, and was dumbfounded when Mr. Keyes removed and handed them back to him unlocked, in from twenty to fifty seconds." So apparently the date of April 23rd, 1895 was when B.B. Keyes first showed his handcuff escape act to an audience. At least it was one of his early exhibitions if not the actual first time. Oddly, the first Handcuff Act that was sold by B. B. Keyes actually went to T. Nelson Downs, this information according to a 1919 letter by Dr. James Elliott. Here is an interesting side note, in the November 1930 issue of The Sphinx, T. Nelson Downs relates a story of meeting up with Houdini at their hotel while Houdini was working the London Alhambra. Downs took from his trunk a ring of 52 keys and said to Houdini, "Here are the tools you do your act with." Houdini replied, "Tom, I don't use keys. You know I did not have the money to buy the keys" etc. Then Downs said, "Well you can't open them with hot air!" According to The Secret Life of Houdini by William Kalush and Larry Sloman, on pg 39 it states that in September 1895 Houdini purchased the above escape act from W.D. Le Roy. Patrick Culliton in his book Houdini The Key, shows several letters between Houdini and W.D. Leroy discussing the handcuff act and some issues that have come up with exposure. These letters were written in 1900, and apparently even at that date, Le Roy was still supplying Houdini with new keys. The handcuff act by Keyes and sold by Leroy was a ring of keys that could be used to open many different styles of cuffs, and likely any brand readily available. Was this Houdini's sole secret to his handcuff act, not hardly. He had been developing handcuff escapes prior to his purchase of the B.B. Keyes method, and no doubt continued to work on new and different techniques to beat any pair of handcuffs, but it was one method he used for sure. However, in 1908, Houdini sold his handcuff act through various dealers as 'The Defiance Handcuff Act'. The kit consisted of a set of keys and picks that would open 62 different handcuffs, and it came with 15 pages of typewritten instructions. This information comes directly from Patrick Culliton's book, Houdini The Key, which has an entire chapter of the Handcuff trick and illustrations of the Defiance Handcuff Manuscript. One of the dealers who sold this was August Roterberg of Chicago. I wonder what W.D. Leroy thought of this? Benjamin B. Keyes, according to the April 1898 issue of Mahatma Magazine, "Keyes possessed almost a mania for automata and constructed some of the most complete mechanical working figures. He was widely known throughout the profession, frequently making goods for jugglers, trapeze artists, bicycle riders, etc.."
In a 1919 letter to Dr. A.M. Wilson from Dr. James Elliott that appeared in the July 1919 issue of The Sphinx Magazine, he mentions that Benjamin Keyes died of Bright's Disease and that he was the one who gave the diagnosis. 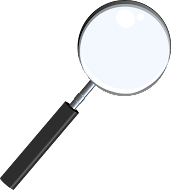 Bright's Disease is an old fashioned word for chronic inflammation of the kidneys. 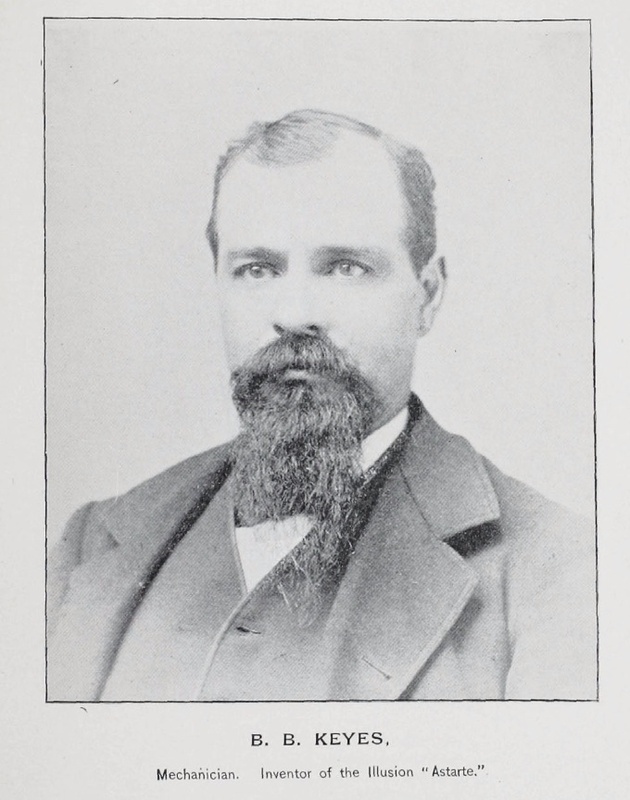 Keyes died in November 1895 in Chelsea, Mass. He would not live to see the fame that Houdini would achieve escaping from handcuffs. the violin. By the age of 19 he was living in San Francisco and was giving classes on the violin. This appears to be where he picked up the magic bug and began to learn the trade. But, whether he met someone or discovered it from a book is not known. 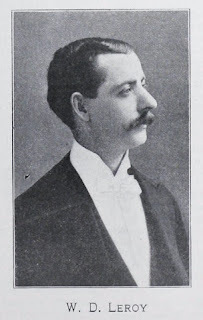 In 1885, he made his first professional appearance as a magician at the Fountain Theatre in San Francisco according to the Feb 1909 issue of The Sphinx. He also appeared on the cover that month. 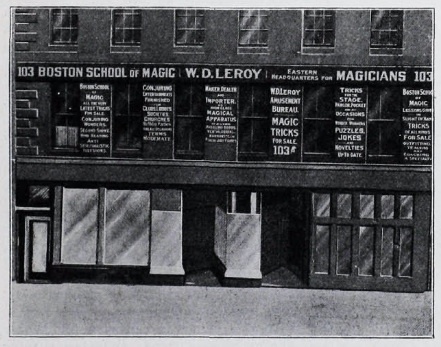 In 1887, he relocated to Boston and by 1893 opened the Boston School of Magic on 103 Court Street. According to the website Auspostalhistory.com, Le Roy altered the way his name was spelled in 1906 from Le Roy to Leroy. I would guess because it was easier to remember or to distinguish himself from Servais Le Roy. He is credited with having the largest and most up to date magic catalog of it's time. 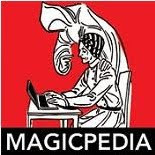 Besides selling magic he was a big advocate of magic fraternities and was instrumental in signing up many people to the Society of American Magicians. Le Roy passed away on June 10th, 1919. He is buried in the Oak Grove Cemetery in Gloucester Mass. I looked up the location of his shop on Google Earth, but sadly, that area has been completely redeveloped. However, below is a picture of his shop that appeared in The Sphinx. *It was actually Samri Baldwin who claimed to have presented the first handcuff escape. I wrote about that in a previous article which can be found here. Wow! Great stuff Dean! Welcome back! Glad you are back to posting too! Thanks Joe. Probably crazy of me considering my schedule, but I enjoy it. The Magic Circular (September 1952) quotes Samri S. Baldwin claiming to have performed handcuff escapes in 1871. Hey Bob, you are correct and thank you for pointing that out. I actually wrote about Badwin's escape in an earlier article, but did not include it in the one above. I have corrected that.